(N) means this particular variety is new to me and (TN) means this type of plant is totally new to my garden. Can you tell I have a thing for kale? I love it raw in salads, and it makes really nutritious chicken food, so I can't wait to try the Proteor forage variety, which I'd never heard of. I also tried to order some yarrow, great burdock, and Verde de taglio Swiss chard seeds, but they were already sold out—a reminder that I really should try to place my seed orders in early January. If you're looking for some general gardening how to and help, I highly recommend The Vegetable Gardener's Bible, which has been my favorite gardening book for the past 13 years. I always turn to it first, and every time I pick it up I learn something new. If you'd like some garden design inspiration, The Complete Kitchen Garden: An Inspired Collection of Garden Designs & 100 Seasonal Recipes by Ellen Ecker Ogden (founder of The Cook's Garden) is a really neat book offering instructions on how to create several different themed gardens in various shapes and sizes, plus recipes using the bounty from each. Think salad lover's garden, children's garden, culinary herb garden, etc. Both of these books would also make great gifts for new gardeners. Have you ordered your seeds yet? Have you started any seeds yet? Are you growing anything I ordered? Do tell! © FarmgirlFare.com, where everything eventually gets purchased and planted, but it may take quite a while—and one of these days I'll put up better fencing and finally have a cat- and dog-free garden. It's fun to have them hang out with you while you work, but not quite worth all the damage they do when you're not looking. I have four types of lettuce seeds and some onion seeds under grow lights in my basement. I still have to plant my garlic -- ugh! I am really looking forward to direct seeding my peas on St. Patrick's Day. Yesterday morning, I discovered that at least one overwintering little field mouse has been nibbling the tops of the lettuce sprouts so I had to reseed some of them. Last week, for the first time ever, I made my own bread using your Farmhouse White recipe. I can't believe it worked so well! Thanks for all the guidance. Congratulations on baking your own bread! I'm so glad you had success with the Farmhouse White recipe. Thanks for the feedback. This is too funny. I just got my catalogue today from Baker Creek. I am so in love with it! First of all, wishing you and the farmily a good year in every way---health,weather,prosperity,ideas,love,just everything---last year was tough! Be careful where you plant that nettles! You don't want it somewhere that you often work because the sting is annoying and persistent; in addition it can be invasive but your raised beds should help contain it unless you let it naturalize somewhere on the farm? Are you sure it doen't grow wild there? We have it everywhere and may add it to some lamb sausage in the Spring when it is young and tender. I ordered from a new seed company that I think you would like: Wild Garden Seed. Great philosophy, all organic, and lots of temptations! The kale selection is particularly good---they breed and select for plants that are suitable for growers like us. Their seed is found in other catalogues I order from but I didn't realize until this year that you could order directly from them. Lastly, and I mean it, if you don't get that garlic planted, I am more than happy to send you a "care package" full for eating and planting! You know where to find me :). Tomorrow and Tuesday we shear the sheep! Just made some raspberry almond bars and lemon coconut bread for the crew (thanks to you!). I think I'm going to just come and live with you. Thanks, too, for all the great advice. That's a good idea about the nettles. I think I will put them in their own spot by themselves somewhere. I know they grow wild around here, but I haven't been able to find any and figured it might be good to have my own cultivated patch. I've stayed away from nettles for years despite their being so nutritious and healing because knowing my clumsy self, I figured I would end up getting stung on half my body, lol, but it seems like everywhere I turn lately there's some mention of them, so I'm taking it as a sign. The same with purslane (well, not the stinging part, thank goodness). I know it's a weed for most people, and my Amish neighbors have it growing wild in much of their garden (and gave me as much as I wanted last year), but I've never seen it growing anywhere on the farm, so I figured I would try starting some from seed. Oh wow - Wild Garden Seed sounds great. I love what they are all about. And you're right - lots of temptations. I will definitely be ordering some of their seeds. Thanks so much. Ha - I just made some Raspberry Almond Bars last week as part of a care package for a starving shepherd friend who LOVES them. I may not have given her quite the whole batch though. ;) And I've been meaning to make a loaf of the Lemon Coconut Quick Bread for ages. I love that stuff, especially toasted. Thanks for the reminder! Am looking forward to your assessment of the various kales next fall. I am sticking to my favourite Red Russian and Tuscan black strap this year, but am always willing to add another....preferably one that freezes well. Now I have to get my seed orders in....late! All right, I just have to ask. I notice you are ordering a boat load of kale. For the Missouri summer--really? I am from St. Louis and my sister and brother-in-law had a small farm near Van Buren, MO, so I know those hot, muggy Ozark (and St. Louis) summers. Are you really implying that kale will live through that heat? I am now living in South Texas (San Antonio)--dry, hot, and with an awful drought. Could kale survive in this climate? Our soil is alkaline and clay-like (most people around here don't really have soil--they've got about an inch of "soil" and then sheer rock, but I'm lucky--I've got a few inches, and I'm making raised beds). I always thought kale was a winter vegetable. Am I mistaken? I just recently learned that chard can tolerate heat--now when people mention "heat," do they really mean South Texas heat, or are they referring to the high 80's? At any rate, I'd love more detail on heat hardiness and kale. P.S. You can read all about how to grow your own Swiss chard from seed (and find links to some of my favorite chard recipes) here. I so enjoy your blog! We live in NW Arkansas, maybe not so far from you? I wonder if you have some advice on how to keep rabbits from eating all my young plants? Last year I planted several rows of beans that we were going to let dry and use for storing. The rabbits destroyed them. We tried spraying with homemade yucky stuff, A scarecrow with a light on at night (which worked for awhile). I am dreading the loss of precious plants this year and the replanting. Do you think covering with row covers would help until the plants got bigger? Help! Ah, rabbits. They can be such a pain. Cute, but voracious. 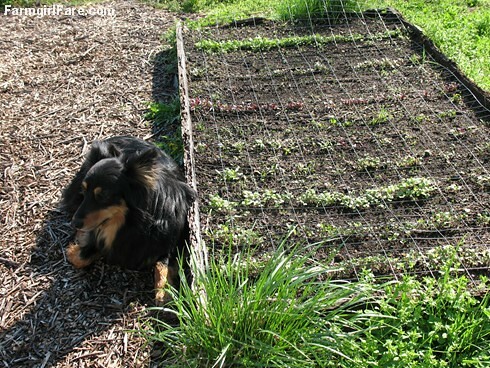 :) The only 100% guaranteed way to keep them away from your plants is to surround your garden - or garden beds - with rabbit proof fencing, which of course isn't always possible. I think floating row covers should help, though you may have to pin them down to the ground to keep the rabbits from ducking under them. Row covers can be tricky because some plants need access from pollinators so you can't keep them covered once they start to bloom. And remember that they also hold in the heat. I was reminded of this the hard way last spring when it started getting really hot and I wanted to protect my lettuce. Instead of making shade with an old sheet and bamboo stakes like I usually do, I laid the row cover directly over the plants - and turned the entire 4x8 bed of gorgeous lettuce to disgusting mush. I hope this comment will not be too forward or too late of me: if we could all plant a little more than what we ourselves will use this year and donate the excess to our local food banks or food pantries when harvest comes? This is my request and my challenge to all of us gardeners – plan for extras around our virtual tables and help the local poor taste locavore at its finest! Thanks to all of you! It's been a very frustrating March for us. After a mild winter, it turned cold and wet in March and we've been able to plant almost nothing. I finally did get the carrots, radishes and spinach planted, but I worry the soil will crust. We're behind on everything else. Thanks for the book recommendations. I recently bought the new book by Pam Dawling Sustainable Market Farming and I'm really enjoying it. Lots of great information in it.